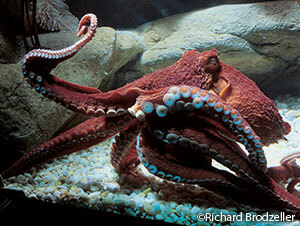 The Milwaukee County Zoo is pleased to welcome Kayin, a female giant Pacific octopus, to the Aquatic & Reptile Center. One-year-old Kayin arrived on October 22, 2015. She weighs about eight pounds and is about four feet long and growing. Kayin, which means “long awaited child,” has her own exhibit located in between the Puget Sound and Pacific Coast Exhibits. It can be difficult to see her at times, since she is skilled at hiding in her den, which she creates by moving rocks in her exhibit. When she wants to be seen, she can do so almost instantly by changing the texture and color of her skin. Giant Pacific octopi are highly intelligent animals, and Kayin is no exception. Her aquarium is outfitted with an acrylic top instead of a typical mesh screen to make sure she doesn’t escape. Kayin is also very interactive. She seems to genuinely enjoy contact with her zookeepers. She will often propel with gusto to the top of her exhibit for her food, where she will eat near her zookeepers and then stay to continue the interaction. She will even sit still and relax as she has her head rubbed, and sometimes engage in a game of peek-a-boo. Kayin is a delightful addition the Aquatic & Reptile Center, and her zookeepers are looking forward to watching her grow and adjust to her new surroundings.